Phil Brown, Michael Ankeny, Robert Cone and Kei Kullberg pop the bubbly in celebration. Photo courtesy of the WPST. By David Schissler – We’ve had a few weeks of frustrating weather here in the White Mountains of New Hampshire. The snow pack is deep but it seems as if we’ve either had rain, freezing rain or sub-zero temperatures lately. I was at our condo in North Lincoln to cover the World Pro Ski Tour’s (WPST) White Mountain Challenge being held at Waterville Valley, a short ride down RT 93. North Lincoln is a stone’s throw from Cannon Mountain and Pinkham Notch (in NH a “Notch” is local vernacular for a pass). Late Friday morning temps were in the 40s with drizzle. By early afternoon it was sunny and thanks to 65 mph winds the wind chill was a bitter -11 degrees! High winds forced the postponement of the race to the next day. By race time the winds abated some but the temp was still right around zero. In spite of the cold a crowd of about 100 hearty New Englanders turned out to see 30 of the best professional ski racers in the world do their thing. The flash freeze mentioned above made for great racing conditions on the legendary World Cup T-bar hill. The course was bullet proof. If you’re unfamiliar with the pro format, it’s head-to-head racing on two identical courses with horse race style starting gates. Other than the differential between the two competitors on course, timing is irrelevant. 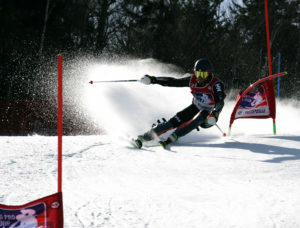 Racers ski each course one time. The skier with the smallest differential advances to the next round. The WPST field draws talent from Olympians, National Champions and NCAA Champions from the USA, France, Canada, Russia and Sweden. The competition is stiff for the $8,500 first place prize. This year Phil Brown, 27 of Toronto, Ontario took first place honors claiming the $8,500 check. 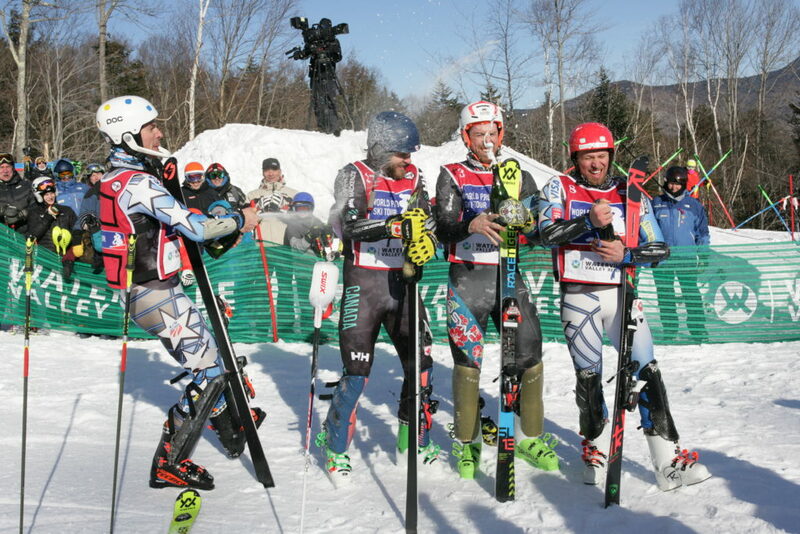 Second place finisher was Michael Ankeny, 28 from Minnetonka, MN, Robert Cone 27 from Killington, VT finishing third and Kei Kullberg 23 from Cornwall, NY finishing in fourth. Phil Brown on his way to $8,500 in 1st place money. Photo courtesy of the WPST.